Witblits is a potent, home-distilled alcohol here in South Africa. The name means “white lightning” and it’s pretty accurate. The stuff is extremely potent, with alcohol contents in the area of 40%-64%. Though I’m pretty sure I’ve seen bottles with much higher content. I know people will immediately want to call it moonshine, but witblits is particular to the Cape area (where we live) and is made from grapes grown here. There’s another variant called mampoer, which is made from different types of fruits. 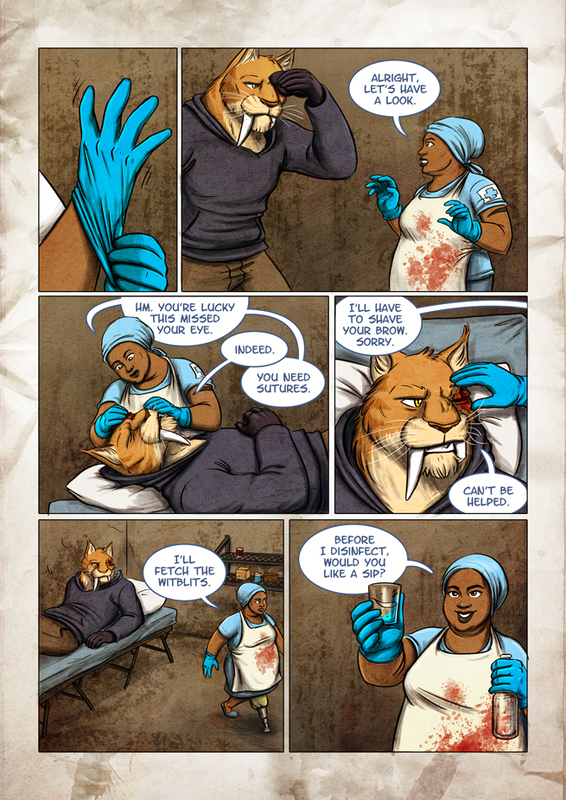 I suppose this is obvious, but in case you missed it: Reka is offering Noah some of the witblits so that he can steel his nerves against the pain of having sutures done on his eyebrow. I’m not sure how a sabre cat would drink from that tiny glass, though. The rest of the tot will be used to disinfect his wound, and I suppose some of the witblits stash gets used in The Longboat’s cooking, too. Multifunctional and efficient! In Italy they have grappa, which sounds like it’s closer to witblits than moonshine. Moonshine is typically made from corn. (There’s also homebrewed fruit brandies, but those are in *real* keep-one-foot-down-while-drinking-so-you-can-find-the-floor-afterwards territory. Corn, interesting! I didn’t know that. And yeah a lot of these home brewed spirits are actually kind of hazardous to your health. There are ways to test if it’s pure and it’s always a good idea to check first. Also helps to know where it comes from. Corn mash is malted corn, you dampen it, let it just start to sprout so the starch converts to sugar. Grind it up, ferment it and the yeast does the rest. As to the danger, lead solder, metal contamination and adulterants like methanol (wood alcohol) are issues. In the US during Prohibition, blindness was often blamed on “copper poisoning” but was due to methanol content due to the bootleg alky being redistilled denatured alcohol or moonshine adulterated with wood alcohol to give it extra kick because it was low quality, low proof garbage. A byproduct of methanol (wood alcohol) metabolism in the body is formaldehyde and formic acid, deadly if you didn’t go blind first or suffer other debilitating health injury. Moonshine… White Lightning in the US is 80-95% grain alcohol moonshine, usually corn mash derived. Its lesser quality relative is Mule Kick, probably from the hangover you get. Many other names regionally, distilled from anything that will ferment. On another note, I love it how the glass seems to be smiling. That’s one friendly Witblits! just caught up. Very enjoyable comic so far. Thanks! 😀 We’re really glad you like it!